After my portrait yesterday of Steve Brooker, the contemporary mudlark, it is my pleasure today to publish this account of a nineteenth century mudlark by Henry Mayhew from his extra volume of “London Labour & London Poor,” 1861. The mudlarks generally consist of boys and girls, varying in age from eight to fourteen or fifteen. For the most part they are ragged, and in a very filthy state, and are a peculiar class, confined to the river. As soon as the tide is out they make their appearance, and remain till it comes in. These mudlarks are generally strong and healthy, though their clothes are in rags. Their fathers are robust men. By going too often to the public house they keep their families in destitution, and the mothers of the poor children are glad to get a few pence in whatever way they can. The following narrative was given to us by a mudlark we found on a float on the river Thames at Millwall, to the eastward end of the Ratcliffe Highway. On our calling to him, he got the use of a boat lying near and came towards us with alacrity. He was an Irish lad of about thirteen years, dressed in a brown fustian coat and vest, dirty greasy canvas trousers roughly-patched, striped shirt with the collar folded down, and a cap with a peak. “About two year ago I left school, and commenced to work as a mudlark on the river, in the neighbourhood of Millwall, picking up pieces of coal and iron, and copper, and bits of canvas on the bed of the river, or of wood floating on the surface. I commenced this work with a little boy of the name of Fitzgerald. When the bargemen heave coals to be carried from their barge to the shore, pieces drop into the water among the mud, which we afterwards pick up. Sometimes we get as many coals about one barge as sell for 6d. On other occasions we work for days, and only get perhaps as much as sells for 6d. We generally have a bag or a basket to put the articles we gather into. I have sometimes got so much at one time, that it filled my basket twice – before the tide went back. I sell the coals to the poor people in the neighbourhood. I generally manage to get as many a day as sell for 8d. We often find among the mud, in the bed of the river, pieces of iron; such as rivets out of ships, and what is termed washers and other articles cast away or dropped in the iron-yards in building ships and barges. We get these in the neighbourhood of Limehouse, where they build boats and vessels. I generally get some pieces of iron every day, which sells at ¼d. a pound and often make 1d. or 2d. a day, sometimes 3d., at other times only a farthing. Pieces of rope are occasionally dropped or thrown overboard from the ships or barges and are found embedded in the mud. Rope is sold to the marine store dealers at ½d. a pound. We also get pieces of canvas, which sells at ½d. a pound. I have on some occasions got as much as three pounds. We also pick up pieces of fat along the river-side. Sometimes we get four or five pounds and sell it at ¾d. a pound at the marine stores; these are thrown overboard by the cooks in the ships, and after floating on the river are driven on shore. I generally rise in the morning at six o’clock, and go down to the riverside with my youngest brother you saw beside me at the barges. In the winter time we do not work so many hours as in the summer; yet in winter we generally are more successful than in the long days of summer. 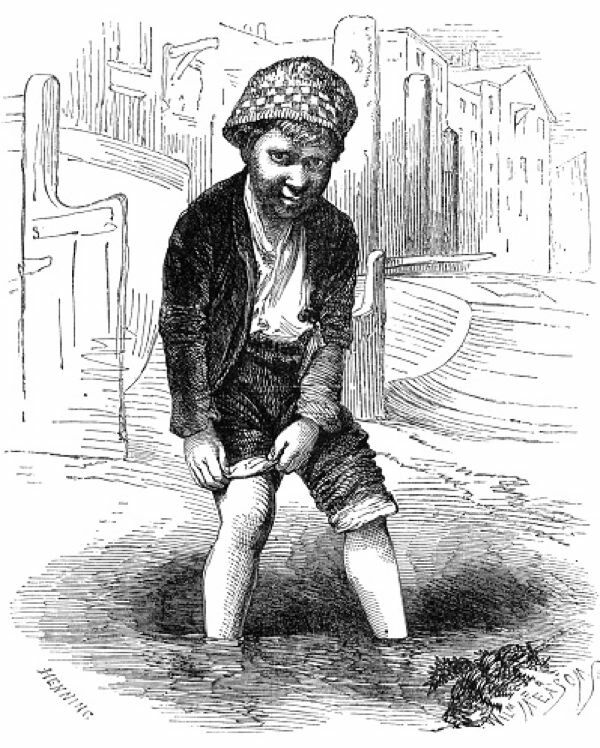 There are generally thirteen or fourteen mudlarks about Limehouse in the summer, and about six boys steadily there in the winter, who are strong and hardy, and well able to endure the cold. Some of the mudlarks are orphan boys and have no home. In the summer time they often sleep in the barges or in sheds or stables or cow-houses, with their clothes on. Some of them have not a shirt, others have a tattered shirt which is never washed, as they have no father nor mother, nor friend to care for them. Some of these orphan lads have good warm clothing; others are ragged and dirty, and covered with vermin. The mudlarks generally have a pound of bread to breakfast, and a pint of beer when they can afford it. They do not go to coffee-shops, not being allowed to go in, as they are apt to steal the men’s ‘grub.’ They often have no dinner, but when they are able they have a pound of bread and 1d. worth of cheese. I never saw any of them take supper.The boys who are out all night lie down to sleep when it is dark, and rise as early as daylight. Sometimes they buy an article of dress, a jacket, cap or pair of trousers from a dolly or rag-shop. They get a pair of trousers for 3d. or 4d., an old jacket for 2d, and an old cap for ½d or 1d. When they have money they take a bed in a low lodging-house for 2d. or 3d. a night. I take what I can get as well as the rest when I get an opportunity. The Thames’ police often come upon us and carry off our bags and baskets with the contents. The mudlarks are generally good swimmers. When a bargeman gets hold of them in his barge on the river, he often throws them into the river, when they swim ashore and take off their wet clothes and dry them. They are often seized by the police in the middle of the river, and thrown overboard, when they swim to the shore. I have been chased twice by a police galley. Henry Mayhew chose to include this account in the extra volume of “London Labour & London Poor” – which was published ten years after his original three volumes – describing “Those that will not work,” because, in spite of their industriousness, mudlarks were dismissed as thieves. The mudlark was published in a chapter entitled “Felonies on the River Thames” alongside smugglers and pirates. There is a tragic poignancy in this nineteenth century account of a resourceful child scraping a living in the face of tyrannical circumstances, yet in spite of its apparent exoticism there are working children elsewhere in the world struggling under comparable depredations today. Henry Mayhew met his unnamed mudlark in the same stretch of Thames between Limehouse where Steve and I combed the shore. Although the shipyards and almost everything that Mayhew would have seen have gone, the rivets mentioned by the mudlark still litter the foreshore today as evidence of the ships, including the SS Great Eastern, that were built there. You could say Steve and I were in the footsteps of Mayhew’s mudlark, if the mud had not erased them long ago. We will never know if the mudlark went to sea, but I hope he found a captain to take him and his brother Fitzgerald on board, and they sailed far away to experience the wonders of the greater world beyond the Thames. 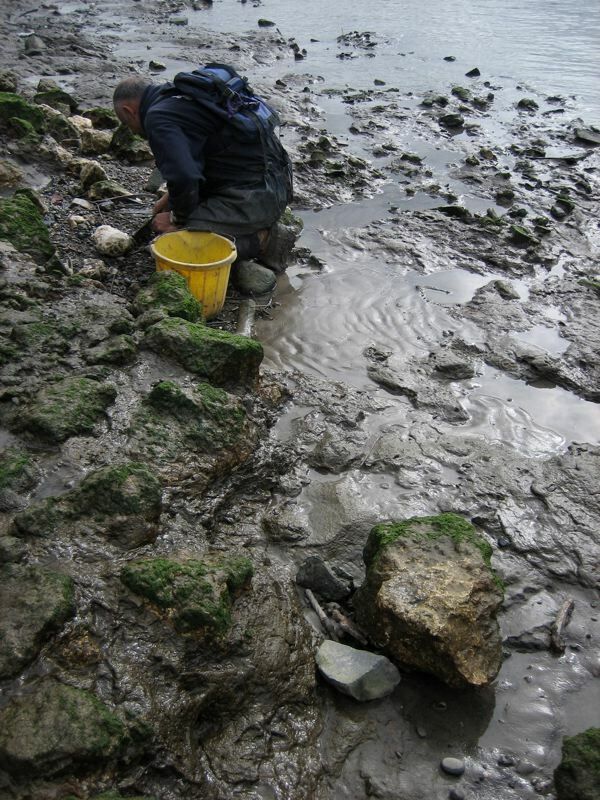 Mudlarking is legal today, as long as you have a licence from the Port of London Authority which costs forty pounds for three years. And the Thames is no longer an open sewer these days, it is a cleaner living river where Steve finds eels and shrimps under every rock he lifts. Steve Brooker became a mudlark out of a passion for history and seventeen years later he has signed a contract with the History Channel to co-present a six part series with Johnny Vaughan, entitled “Mudmen.” Life is very different for a mudlark in London a hundred and fifty years later, there are career prospects now. Steve Brooker, twenty-first century mudlark, has a deal with a television network. Bravo – wonderful, interesting articles on mudlarks. Very interesting!There was a film called “The Mudlark”** when I was young,starring Andrew Ray , son of the comedian Ted Ray ,sadly neither still with us . As an adult , Andrew was on the team in “Face the Music” ; that was a brilliant TV prog ! I hope the History Channel UK sells the Mud Men series to the History Channel US. I’d love to see it, but my oh my, will the foreshore be swarming when those episodes run! I enjoyed this article. I’m a teacher and am starting a project on the Thames. Have you come across any other references to mud larks, other than Mayhew? It’s an amazing find and my daughter finally understood!